The Primal Force company is dedicated to providing quality products designed to boost wellness and address health issues. These issues are growing more and more common. In our modern world, it's hard to get everything our bodies need. This is largely due to the negative aspects of the modern diet and lifestyles that involve busy schedules and less time to focus on wellness. Supplements aim to make achieving wellness easier, among improving other areas of health, and Primal Force offers only the highest quality supplements available. With a firm belief in real results and the science behind nature's healing prowess, each product aims to restore health and wellness while easing many of the ails people face today. The answer to your health issue may easily lie in one of Primal Force's revolutionary supplements, designed to help alleviate the effects of weight gain, joint pain and inflammation, energy issues, heart health, and more. The company's top sellers, Estro-Cleanse and Accel, are only two examples of the fine health supplements Primal Force offers. Estro-Cleanse is a good example of how these products target real issues caused by our modern lifestyles. The supplement addresses the abundance of estrogen in food sources and the environment and its negative effects on weight. The product helps men eliminate estrogen in their bodies and lose fat while gaining energy. Accel is a powerful CoQ10 supplement that boosts energy and promotes healthy cells. Its no surprise that both supplements are popular because they target real problems everyday people face and deliver results. 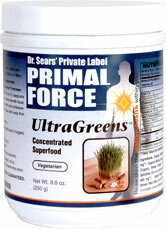 Headed by Dr. Al Sears, Primal Force focuses on real medical science and authentic results. Dr. Al Sears is a respected health professional and founder of the successful Center for Health and Wellness. His years of medical experience and expertise in natural healing have lead to extraordinary products that have changed the lives of thousands for the better. He has done extensive, ground-breaking research on anti-aging and harnesses the power of nature in treating patients and helping customers. Dr. Sears has been a true pioneer in the field and his efforts haven't gone unnoticed - he contributes to various well-respected websites and has appeared on numerous radio outlets. Dr. Sears also pens his own newsletter, Health Confidential, through his website at alsearsmd.com, and is an author of natural healing books. His series of books and reports have touched lives around the globe. He has traveled far and wide to discover exotic new treatments and unlock ancient healing secrets. His extraordinary discoveries are now available to all through Primal Force. Dr. Sears' dedication and research have truly laid a strong foundation for the company to thrive.